During a recent trip to visit friends in Serra Negra, a town in the countryside of São Paulo, we managed to shake off our Saturday morning hangovers just in time to make a lunchtime pit stop at Cervejaria Dortmund, the town’s local microbrewery. Marcel Longo, the microbrewery director, kindly showed us around the site and also provided some generous tasters from a variety of the beers Dortmund produces. He also kindly offered to answer some questions by way of an interview, which you can find in English below and Portuguese at the bottom of this page. Hey Marcel. Let me start by saying thank you for agreeing to answer some questions for the book is on the table! Also, thanks again for showing us around the Dortmund premises on our recent trip to Serra Negra. Despite our hangovers I’m glad to say we also really enjoyed the beer-tasting as well – you’re producing some great beers there in Serra Negra! 1) Anyway, let’s start by getting to know a little bit about yourself. How did you get into beer and brewing? I started to get interested in beer in the year 2000, when I first got in touch with some imported beers that were being imported to Brazil. From there onwards I started to visit breweries in Brazil and abroad in order to learn more about the manufacturing process. I bought many books and magazines and finished a home-brewing course. 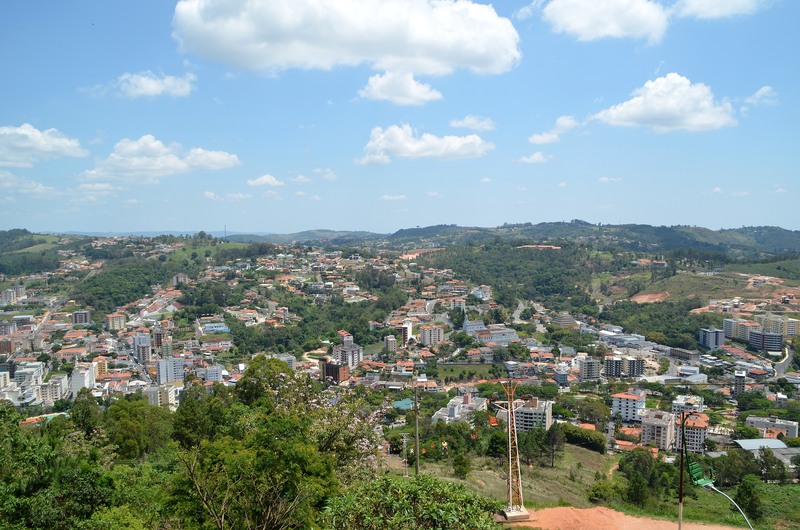 Then, I attended a course in SENAI, in the city of Vassouras and finally, in 2011, I opened the factory in Serra Negra. 2) And tell us a little bit about Cervejaria Dortmund. How long has Dortmund been brewing beer, how did it all start and how did you get involved? Does the company have a link to the city of Dortmund? It started in June 2011. I am responsible for everything at the brewery, actually, except for the production. The German city of Dortmund gave us all incentive we needed to use their name and their coat of arms; they were very excited about the idea. 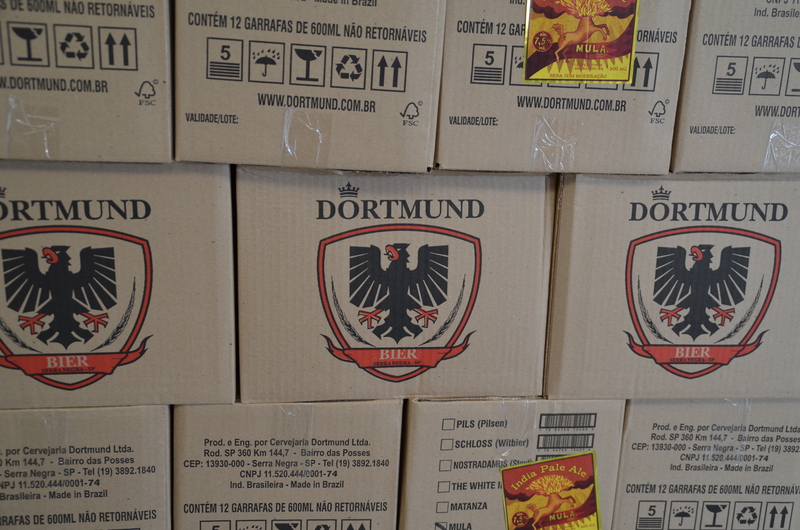 3) How many beers does Dortmund currently produce, and what are they? Most importantly where can we buy them from? Pilsen, Schloss Witbier, Nostradamus Stout, The White IPA, Matanza IPA, Ols Ship Pale Ale and Linderhof Weiss. You can find our beers in São Paulo, Paraná, Minas Gerais, Rio de Janeiro, and Mato Grosso. Besides, there are some websites selling them and you can also subscribe to beer clubs that will send our beers to you. Yes, it’s impossible not to change your taste after trying craft beers. Made with pure malt, they undergo a 30-day maturation process, and there’s also all the thought and care that is put into their production. When you try these beers you hardly ever go back to the mass produced standard lagers. I really like the Pumpkin Ale from Sauber Bier, in Mogi Mirim. I’m a big fan of wheat beers, especially from Belgium or Germany, such as Paulaner and Blanche de Namur. 7) What do you hope for the future with Dortmund? Are you hoping to expand and maybe export your beers abroad? We’re already expanding. We have doubled in size since opening and by the end of the year we will grow another 80%. 8) Finally, what advice would you give someone (like me) who would like to brew beer and potentially start their own microbrewery in Brazil? First of all you must bear one thing in mind: why are you starting this brewery? If you want quick financial return, you’d better go to a casino and gamble. You won’t get rich by selling (hand-crafted) beer in Brazil. Every single law is against you and small industries face enormous difficulties. You need to have other businesses that can maintain your brewery going for a few years until it starts to give you some profit. A lot of dedication and love is needed to make sure it is successful. Learning about beer is also very important. Although it may seem absurd, many entrepreneurs have opened breweries without having the slightest idea of how the whole thing works. You can find out more about Dortmund via Twitter (@DortmundBier), Facebook or on their website. Olá Marcello. Primeiramente deixe-me agradecê-lo por concordar em responder algumas perguntas para o meu blog, o the book is on the table! Também queriaagradecê-lo pelo tour na fabrica da Dortmund em Serra Negra. Apesar da ressaca, posso dizer que aproveitamos bastante a degustação – você está produzindo ótimas cervejas aí em Serra Negra! 1) Bom, para começar, gostaria de saber um pouco mais sobre você. Como você se envolveu com a produção de cerveja? Comecei a me interessar pelo mundo da cerveja no ano de 2000 quando tive contato com as cervejas importadas que chegavam ao Brasil, a partir dai passei a visitar cervejarias no Brasil e Exterior a fim de conhecer mais sobre o processo de fabricacao, comprei muitos livros e revistas e fiz curso de cerveja em casa, depois fiz o Senai de Vasouras e finalmente em 2011 inaugurei a fábrica em Serra Negra. 2) Fale um pouco sobre a Cervejaria Dortmund. Há quanto tempo vocês produzem cervejas? Como tudo começou e qual foi seu papel? Há alguma conexão com a cidade de Dortmund? Começou em Junho de 2011, sou responsável por tudo na cervejaria, exceto produção, a prefeitura de Dortmund nos deu todo o incentivo para utilizar o nome e o Brasão da cidade, e ficaram muito empolgados com a idéia. 3) Quantas cervejas estão em produção no momento? Quais são elas? E, mais importante, onde podemos comprá-las? Pilsen, Schloss Witbier, Nostradamus Stout, The White IPA, Matanza IPA, Ols Ship Pale Ale e Linderhof Weiss. Temos distribuição em SP, PR, MG, RJ, ES e MT, além de sites que vendem e clubes de assinatura que enviam nossas cervejas. 4) O mercado brasileiro é dominado pelas Pilsners como a Brahma, a Skol, a Antarctica e a Itaipava, etc. Contudo, parece que nos últimos anos as microcervejarias começaram a se popularizar. Por que você acha que isso aconteceu? Será que o gosto do brasileiro está mudando lentamente? Sim, não há como não mudar de gosto ao experimentar uma artesanal feita com puro malte, maturação de 30 dias e todo o cuidade que temos na elaboração do produto. 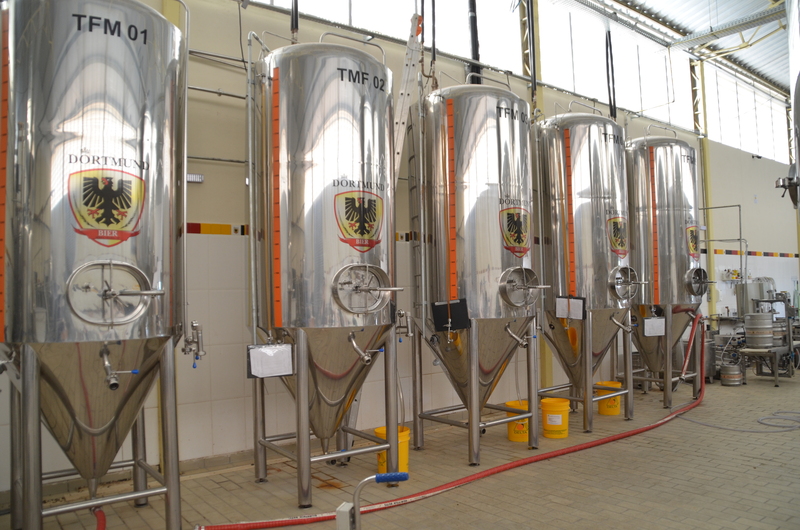 Quem experimente dificilmente volta para as Standard Lagers feitas em massa. 5) Quais são as suas microcervejarias favoritas no Brasil no momento? E as suas cervejas brasileiras favoritas? Uma cerveja que gosto muito é a Pumpkin Ale da Sauber Bier de Mogi Mirim. 6) E as cervejas internacionais? Quais são suas preferidas? Sou fã das de trigo, sejam elas belgas ou alemãs, gosto da Paulaner e Blanche de Namour. 7) Qual a sua expectativa para o futuro da Dortmund? Você gostaria de expandir ou talvez exportar para fora do país? 8) Finalmente, que conselhos você daria para alguém que (como eu) gostaria de começar sua própria microcervejaria no Brasil? Primeiramente é preciso ter em mente uma coisa, qual o objetivo de se montar a cervejaria, se for para ter retorno financeiro rápido melhor ir a um cassino e arriscar na roleta, não se fica rico vendendo cerveja (artesanal) no Brasil, todas as leis são contra as pequenas industrias e as dificuldades são enormes. É necessário ter outros negócios que possam sustentar a fábrica por bons anos até que ela comece a dar algum lucro. É necessário ter muita dedicação e amor ao negócio para que ele vá pra frente. Conhecer sobre cerveja, apesar de parecer absurdo também é necessário, muitos empresários montam cervejarias sem ter a menor ideia de como funciona. Saiba mais aqui: Twitter (@DortmundBier), Facebook e o website. Class! The owner is right once you try craft beers it’s hard to go back to made market pish. We’re seeing a similar phenomenon here in Madrid, Spain. Any recommendations for craft beers in Argentinea? Sorry the predictive text is making this smartphone user a spelling dunce! Hmmm not really. Never there long enough to get past Quilmes. Besides, it’s always a treat just to stick to the red wine when you’re in Argentina!